Carbon dioxide is the coolant of the first all-electric Citaro bus, which will soon enter series production. 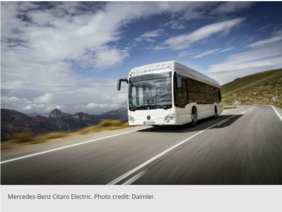 In a sign that natural refrigerants are making greater inroads into the transport sector, Mercedes-Benz has chosen carbon dioxide as the refrigerant for its worldwide best-selling city bus, the Citaro. The firm cited energy efficiency, sustainability and passenger comfort among the reasons for the decision. The Stuttgart-headquartered company recently presented a new zero-emissions bus prototype that runs almost silently. The efficiency of the air-conditioning (AC) system is ensured by the use of CO2 as the coolant. Carbon dioxide is proven to perform well even amid external temperatures of -10 degrees Celsius. In wintertime the AC system can also be used as a heat pump, extending year-round climate control to the passenger compartment. In the event of a refrigerant leak (e.g. resulting from a car accident), CO2 is neither flammable nor toxic, reducing possible risks to passengers and the driver. To reduce energy waste, the internal temperature of the bus is not set at a consistent level for the entire year, but it is configured according to the season. This is beneficial for the passengers, who usually stay on the bus for limited amount of time. To ensure the physiological safety of the driver, who instead spends hours on the bus, the temperature in his workplace is controlled separately, at an average 24 degrees Celsius temperature whatever the month of the year. Mercedes-Benz is one of the first bus manufacturers to use CO2 as a coolant. Orders from Hamburg and Berlin local transportation companies were already received: the first units will be handed over by the end of 2018. Amongst the other eco-friendly innovations of the bus, the intelligent modular concept for the battery technology (adaptable to each separate route) will be charged from a power socket as standard. Citaro vehicles have been at the forefront of sustainable transportation since 2012, when they became the first buses in the world to meet the stringent Euro VI emissions standard. The new all-electric version of Citaro marks another step in the direction of more sustainable city transportation.